Mood board: A/W 2017 marked the label’s blend of its womenswear and menswear offerings, with the label presenting both collections together in its usual South Bank location. 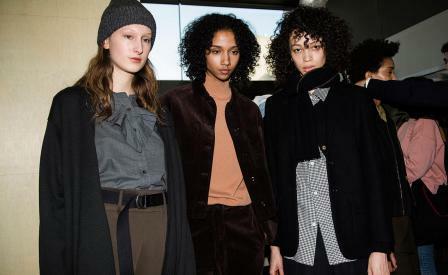 Androgyny is integral to Margaret Howell’s consistent aesthetic, and models sported timeless pieces, from oversized mackintoshes to cord trousers, tweed overcoats to pinstripe shirts, in a natural colour palette of navy, brown and green, with flashes of orange and neon yellow. Best in show: Preoccupied with workwear silhouettes, Howell sent a series of women’s aprons down the runway, layered with shirts and trousers, with ties that trailed loose around the leg. For men, this workwear focus was seen in high-waisted trousers hoisted with braces, and brown leather waistcoats, offset with more city-focused paisley and plaid ties. Finishing touches: Models sported bucket and bobble hats, and short scarves jauntily knotted off-kilter around the neck. Black trainers also came with retro ‘M’ logo detailing.